PennsylvAsia: Korean films The Thieves (도둑들) and Architecture 101 (건축학개론) at Pitt this month. 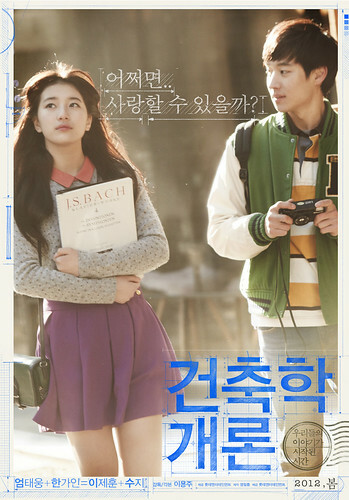 Korean films The Thieves (도둑들) and Architecture 101 (건축학개론) at Pitt this month. The movies The Thieves (도둑들) and Architecture 101 (건축학개론) will comprise this spring's Korean Film Festival at the University of Pittsburgh, now in its 10th year. Both films are new, were successful in Korea, and have found international exposure through large film festivals in London and New York, respectively. In order to let things cool down from their latest heist, Popeye and his group of thieves go to Macao on a job. But the mastermind behind this job is none other than Popeye’s old partner Macao Park, who escaped with 68kg of gold several years ago on their last job together. Macao Park brought Chinese thieves as well but little did they know what Macao Park planned for each one of them. But his plan takes an unexpected turn when Popeye brings Pepsi, an old flame of Macao Park, to settle the old score. The film reignited 1990s throwback fever among Koreans and made the fashion, music and celebrities of the period cool once again. Songs from the '90s, including duo Exhibition’s "Etude of Memory" were included on the score. Characters also use pagers, hair mousse, and portable CD players. The protagonist is even obsessed with GEUSS T-shirts - counterfeits that were popular among Koreans in the 1990s. Nostalgia-inducing scenes that feature characters expressing awe at a one gigabyte hard drive computer or communicating with each other via landline telephones also brought the audience back in time. In his college days, aspiring architect Seung-min (UHM) fell deeply in love with classmate Seo-yeon (HAN). However, fate denied them the opportunity to stay together forever. Now a successful architect, Seung-min has not spoken to Seo-yeon since that time. However, one day she suddenly reappears in his life, asking him to design a replica of her childhood home. Moving back and forth from past to present, the affections and heartaches between Seung-min and Seo-yeon slowly unfold, and it appears that fate may give their love a second chance. The Thieves plays on March 19, and Architecture 101 on March 26. Both are held in room 4130 Posvar Hall on the Pitt campus (map) at 5:00 pm, and both are free and open to the public. The campus is accessible by any city bus that goes to Oakland, and parking is available at, among other places, meters around Schenley Plaza and the Carnegie Library across the street or in the Meyran Ave. garage two blocks away.